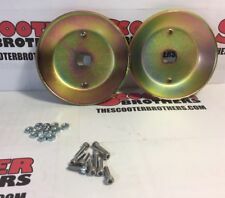 Walker Mower Blade hubs (qty (2)). You also get 10 each of blade bolts and nuts. 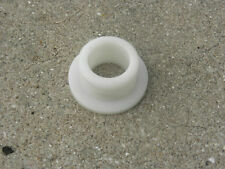 DECK SHOCK WASHER BUSHING for Walker Mower Decks fits 36", 42", 48", 54" and 56" decks. 4 Deck Shock Washer Bushing 1 3/8 x 5/8 x 1/2" thick. Walker Walk Behind Mowers 32" 42" 48" 52" 54" 56" with GHS Decks. Tread: Smooth. Type: Flat Free. We recycle! Hub: 12 1/2 cm. Our team works hard to find you the best deals and provide you with a wide selection of products. 4 PK. 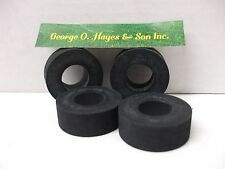 - DECK PIN BUSHING 5/8" WALKER 5740-2 FREE SNAP RINGS !! 5 out of 5 stars - 4 PK. - DECK PIN BUSHING 5/8" WALKER 5740-2 FREE SNAP RINGS !! 1 product rating1 product ratings - 4 PK. 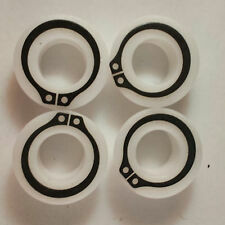 - DECK PIN BUSHING 5/8" WALKER 5740-2 FREE SNAP RINGS !! 4 Deck Washer Shims 5/8" ID. 4 Deck Shock Washer Bushing 1 3/8 x 5/8 x 1/2" thick. 4 of 5740-2 5/8" deck bushing. 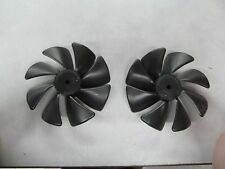 Up for sale is a new OEM Walker mower hydro fan set part number 6243-1 and 6243-2. WALKER MOWER PART. This is a New Product Release of a front mount cup holder. This fits all Walker Mower with tilt-up Latch. Holds a wide range of drink container sizes, tapered design with rubber tabs to secure container. Kit fits 36", 42", 48", 54", 56", and 52" GHS Decks. This is a SET of 2 Rubber Mat (foot treads) 3" x 6" that go on the gearbox cover plate as in the second photo. Turf Tires Low Profile. Pair of 18x10.50-10 Walker Low Profile Turf Tires. Walker Mower. Fits Walker Mowers T and D Models. Product Details Type: Tubeless. Up for sale is a new OEM Walker mower gas spring assembly part number 5155-4. WALKER MOWER PART. This will NOT fit the 48DR models. WALKER MOWER PART. Trending at $86.00eBay determines this price through a machine learned model of the product's sale prices within the last 90 days. T his chute will fit Walker 36 & 42" GHS mower deck models. You also get two (2) #5747-10 Foot mats (3" x 6"). Replaces Walker P/N F202 & F002. Fits all Walker Gear Drive Decks. This is a SET of two (2) Foam Filled Tires (greaseable). 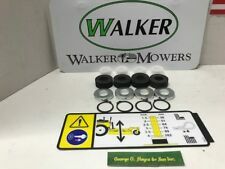 Walker Mower DEEP Dust Cap SET (2) OEM #8769-8. These are for 52"/ 62" & 74" Walker Mower Decks. Make sure you are ordering correctly. (I got lucky). After 2 years my LM had only 12 hours. on it so the seat shows very little sign of use. 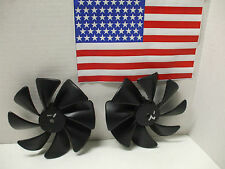 Up for sale is a new OEM Walker mower hydro fan part number 6243-2. WALKER MOWER PART. Genuine OEM PTO Belt for T & C models triple V Banded. Walker P/N F202 & F002. Shear Bolts & Nuts For Walker Mowers. Includes 12 Bolts & 12 Nuts. You also get 10 each of blade bolts and nuts. Walker Mower OEM 7234-2 Blower Belt Overstock CLEARANCE Sale! New Walker OEM Belt part #7234-2. 5 out of 5 stars - Walker Mower OEM 7234-2 Blower Belt Overstock CLEARANCE Sale! 1 product rating1 product ratings - Walker Mower OEM 7234-2 Blower Belt Overstock CLEARANCE Sale! This will NOT fit the 48DR models. 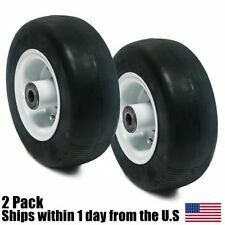 Will fit caster wheel size 8x3.00-4/2.25 found on 36" 42" 48" (52"GHS) 54" 56". 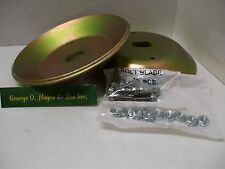 Up for sale is a new OEM walker mulch blade with hub part number 5706-6. It is your responsibility to make sure this belt fits your machine and that it is the correct belt! WALKER MOWER PART. 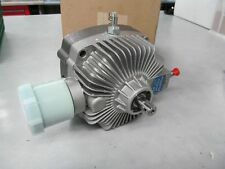 Up for sale is a new OEM Walker mower gearbox right hand rotation part number 5053-1. WALKER MOWER PART. Up for sale is a new OEM Walker mower grass-pak switch upgrade kit part number 5592-20. WALKER MOWER PART. Up for sale is a new OEM Walker mower hydrostatic transmission part number 5025. WALKER MOWER PART. Good working condition part ready for your project. Part has been cleaned. Used Walker gearbox in good working order. Fully cleaned and new lower seal. Part #5052-1 Threads and splines are in good condition. This kit contains: your basic deck decal kit 42" and 48" and model T tractor decal kit;. 2 Touchup Paint yellow (12 oz Aerosol) 1 Touchup Paint Grey (12 oz. ). This is a Smooth Flat Free pneumatic tire with a permanent, self-healing polyurethane rubber lining that is securely adhered to the inside of the tire casing. Tire size is 13 x 8 - 6 Puncture resistant ! Up for sale is a new OEM Walker mower gas spring assembly part number 5145. WALKER MOWER PART. Up for sale is a new OEM Walker mower hydrostatic transmission input shaft repair kit part number 5025-13. Due to California's Proposition 65 this item is not available for sale within the state of California. 1xAir filter. Cell Phone Accessories. We accept order cancellation. We would highly appreciate the chance to follow up with you if needed. UK,CA,AU,FR and other countries need 4 or 5 weeks to receive your item(s). Up for sale is a new OEM walker mower gas spring that assist with raising and lowering the catcher box on most walker GHS machines part number 7145. It is your responsibility to make sure this part fits your machine and that it is the correct part! You get a SET of (4) P001. These seals are for gearboxes that contain gear oil on Walker Mower decks. If your blade hubs have signs of oil it's common this seal is leaking. Up for sale is a new OEM Walker mower hydraulic filter part number 4025-5. WALKER MOWER PART. Replaces (OEM): WALKER. Replaces (OEM): WALKER 7705-2. Three complete sets. Total of 6 Blades. Requires (1) Right Hand &(1) Left Hand Blade. Requires 1 of 6169 and 1 of 6170 for 48" cut. The only way to insure that you are ordering the correct part is to match this number to your application. This is a Walker Mower Filter Kit for Model C 18 and 20hp, Model T 20hp, 23hp, 25hp Command Engines. This will fit the newer 25i model with the plastic fuel filter. (1) 5090-3 Safety Filter. (1) 5090-1 Air Outer Filter. T his chute will fit Walker 9.5 & 10 Bushel GHS mower deck models. OEM Walker part # 5715-18. Caster Wheel Asm. Solid Rubber.W / Spacer.